For some of us that have been long time Glo customers, we might have come across Glo GBAM one way or the other. For some of us who know nothong about it, Glo GBAM is a tariff plan that has been available for over 3 years now but only a few have been enjoying the goodies the tariff plan has to offer. The tariff plan gives new and existing customers cheapest call rates and daily free data to browse your favorite website. With Glo GBAM, you will enjoy as low as 11kb/sec call rate which can be used to call five special Glo numbers, as well as daily free 5MB data. To enjoy this offer, the tariff plan attracts a daily fee of N5.00 only. 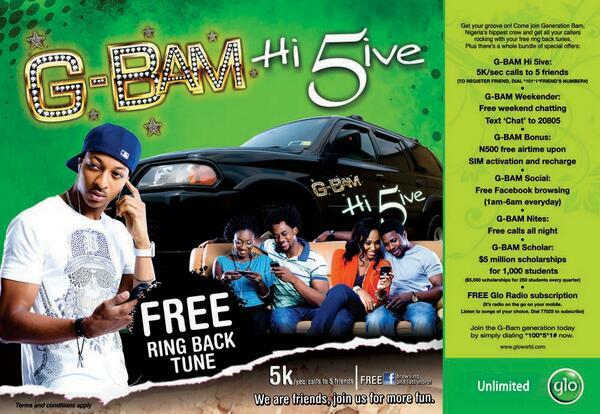 This will give you access to enjoy low call rates and as well free 5MB data. Call friends and families as special numbers at 11kobo/sec. Free Night Calling is available. Note that the first registration of those five numbers are free but to delete or modify those numbers will attract a fee of N50.00 naira only. To modify the special numbers, simply dial 1012existing numbernew number#and send. Onnet call rate is 15kobo/sec and calls to families and friends is charged at 9kobo/sec to five glo numbers and offnet call rate is 15kobo per second. Onnet and offnet SMS rate are charged at N4/SMS and international SMS rate is N10/SMS. Use N30 between 00:01 and 23:59 and enjoy free onnet calls from 00:00 to 04:59every day. Like i said earlier, Glo GBAM attracts a daily fee of N5 naira, and when it’s been deducted, you will be given free 5MB data to browse your favorite sites. You can browse with your airtime as pay as you go when you exhaust the 5MB data. Simply dial 1005*1# to migrate to Glo GBAM tariff plan. It’s available for both new and existing subscribers on the network. It’s very simple. Just migrate to another tariff plan. With that, you will be deactivated automatically. Scrap as usual, any good offer should be considered useless until they improve their quality of service nation wide. I really like the plan except for the 5naira fee. The 5mb is totally inconsequential an Android though.